"E3database - An Introduction into the Life-Cycle Analysis Tool"
This introduction deals with the relationship between Life-Cycle-Assessment LCA) and the E3database tool. E3database is a tool in the context of LCA and Well-to-Wheel Analyses. It allows the modelling and comparison of all types of energy chains / pathways from primary energy source to final energy use. A comprehensive definition of LCA is given in ISO 14040 ff. but only few make sense (which then is already a result of an LCA). But despite the theoretical and practical limitations of LCA, this is the best method we have to assess and compare different energy systems. LCA will always be work in progress. But it helps our understanding of energy systems and gives orientation where to look for the more sustainable solutions. (4) the dismantling and disposal of supply infrastructure and vehicles. a presumption that the effects are of minor importance. E3database ensures full transparency of modelling assumptions and calculations. Transparency of data and methods is a precondition for a rational discussion of LCA results. E3database is now frequently used for the modelling of fuel pathways for transport systems with primary energy sources based on either fossil energies, or biomass or nuclear or renewable electricity. But the tool is not confined to this area of applications, it is possible to use the tool for the modelling of all kinds of energy pathways. sensitivity analyses and stochastic analyses. E3database is well structured and subdivided into a calculation tool and a data database containing all input data. 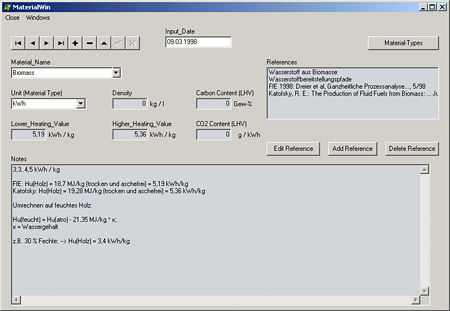 By using the approved calculation tool the user can concentrate on the empirical aspects of modelling. The user is fully flexible to use existing data or to add individual customer databases or a mix of both. Databases can be shared or published to harmonise or compare assumptions between user groups. E3database is easy to use through it's graphical user interface and it's full transparency of the underlying data. facilitates data exchange between partners in distributed projects. the technical rationale behind the modelling of an energy chain. modelling of evolution over time is not possible. E3database can be used to supply basic data for a more comprehensive evaluation of energy chains and regional scenarios by the user. are taken into account and are presented separately. In this method the efficiency of electricity generation from nuclear power is based on the heat released by nuclear fission which leads to an efficiency of about 33%. In the case of electricity generation from hydropower and other renewable energy sources which cannot be measured in terms of a calorific value (wind, solar energy), the energy input is assumed to be equivalent to the electricity generated which leads to an efficiency of 100%. CO2, N2O, CH4, CF4, SF6, HFC 134a. NOx, SO2, CO, NMVOC, Dust/PM. The GHG emissions are also expressed as CO2 equivalents. For example: CO2 =1; CH4 = 23; N2O = 296. Why use the E3database tool? The E3database software consists of two parts: the E3database program (comprising the graphical user interface, the database frontend and the calculation algorithm) and an SQL database management system (containing all data required for the modelling of energy chains). The program has been developed using the Borland Delphi programming language. The graphical user interface assists the user in the input of data into the database and in the modelling, storing and calculation of energy chains. All calculations of the chains are carried out in this program. The SQL database is used for storing all the basic input data and the data describing the modelling of the energy chains. The open source SQL database Firebird is used. It can be installed and run on a local computer or on a server within an intranet. Calculation results are not stored in the database but can be exported for storage and further processing (e.g. in Excel spread sheets). has a small footprint (10 MB for program and system files plus storage place for databases). The software can even be run from a memory stick. A connection to the internet is desirable (it is necessary for data exchange between partners, but is no functional requirement for the tool itself). The following sections describe the modelling of energy pathways in the E3database tool. First, the basic entities are described. These are processes with their inputs and outputs together with the basic data used in the tool. Energy chains are entities constructed by connecting different processes to model an energy pathway. Then, for energy pathways the algorithm for the calculation of the energy consumed, the emissions and costs is described. Different methods for the modelling of energy chains with co-products are described. The calculation results delivered by the E3database are described. Also, simple examples are given to demonstrate the modelling of energy pathways. 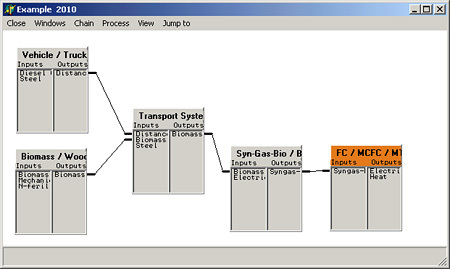 A process is used in E3database to model basic entities in energy pathways. A process can model a a wide variety of installations, plants, transport systems, technical components etc. For instance, a process can describe a plant for energy generation (e.g. a coal fired power plant or a windmill), a plant for the conversion of energy (like a refinery or a steam reformer) or a filling station or a power transmission, a truck, a passenger vehicle, etc. When defining a process, the level of aggregation can be chosen by the user. The definition (and interpretation) of what constitutes a process is very flexible as there is no predefined level of abstraction or aggregation. For instance, one can model a process “electricity from biomass“ where the input is biomass and the output is electricity. But it would also be possible to split this aggregated process into three separate processes, e.g. “fermentation“, “gas cleaning“ and “electricity generation“ which have to be connected with each other to form a chain (see below). Every process has a unique name. A process has inputs and outputs (called “materials”) with corresponding specified dimensions. One output has to be defined as being the “main output”. For every input, the amount has to be specified which is required to generate one unit of the main output. A process has specified amounts of emissions. A process is described with regard to economic data. The data describing a process can be differentiated with respect to time horizon, upper and lower boundaries for certain parameters, and also probability distributions for certain values can be given. Stochastic data can be used to carry out Monte-Carlo simulations. The following screen shot shows the window in the E3database tool describing individual processes. The screenshot (above) shows how a process is represented on the Graphical User Interface. This representation states only the name of the process and all its inputs and outputs. e.g. concrete, steel, copper, etc. e.g. crude oil, natural gas, coal, electricity, heat, etc. e.g. vehicle-km, truck-km, ton-km, etc. and other properties needed for the modelling of energy pathways. The screenshot below shows the window in E3database for the definition and description of inputs and outputs (“materials”). values for the amounts of all input(s) and output(s). Many processes have inputs and outputs being energies. All types of renewable and non-renewable (fossil, nuclear) energy sources are possible in E3database. When modelling fuels derived from biomass, the renewable energy use includes the energy content of the harvested biomass (i.e. the lower heating value (LHV) of the dry matter). In case of electricity generation from renewable energy sources which cannot be measured in terms of a calorific value ( hydropower, wind, solar energy), the energy input is assumed to be equivalent to the electricity generated. This leads to an efficiency of 100%. The emissions are also expressed as CO2 equivalents. For example: CO2 =1; CH4 = 23; N2O = 296. Detailed economic data can be stated for investment, economic lifetime, O&M costs, interest rates, etc. They are used to calculate aggregate or specific costs. Specific costs for the main output. Energy pathways are perceived to consist of a collection of individual processes which are connected in a specific way by their respective inputs and outputs. The modelling of an energy pathway in E3database by a collection of processes and their connections is called a chain. A chain is any energy pathway consisting of two or more “processes”. Typically, a chain starts with one or more primary energies (and other “materials”) and ends with the provision of a final energy or a service (“Well-to-Tank”, “Well-to-Wheel”). A chain has a unique name. Processes in a chain are connected via inputs and otputs (“materials”). Every chain has a final process (called the “tail” process). A chain typically represents an energy pathway from well to wheel. The following screenshot shows a simple chain for the supply of electricity produced from biomass: The chain consists of five processes, all symbolised by a process box. The biomass is transported to a gasifier where it is converted to syngas. The syngas is finally converted in the tail process - a Molten-Carbonate-Fuel-Cell (MCFC) - to electricity, the by-product being heat. 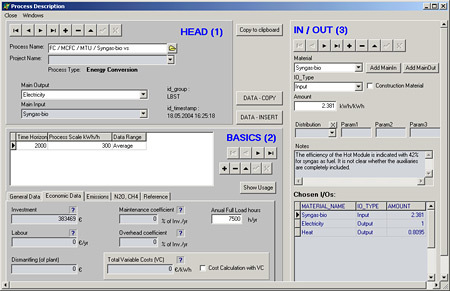 Making use of the Graphical User Interface of E3database, a chain can be modelled by placing individual processes on an empty screen in the Chain window and connecting the processes by clicking with the mouse on corresponding inputs and outputs. Only inputs and outputs of the same type can be connected. The tool ensures full transparency for complex energy chains. The modelling follows a strict bottom-up approach: starting with inputs and outputs (materials) being – as it were - properties of processes, and defining processes which are then aggregated to chains. The tool assists the easy modelling of chains (initial setting up of a new chain, modifications and extension of existing chains). This demonstrates: E3database is a tool to greatly facilitate the modelling of energy chains. For the chains / pathways modelled with E3database, the tool calculates results for energy use, air pollutants and greenhouse gas emissions as well as costs. Results can be compared in a transparent way and sensitivity analyses can easily be carried out. The primary aim of the calculation algorithm is to determine the aggregate amount for all types of inputs in the chain which are necessary to supply the required output of the tail process. This result describes the “activity level” of all processes in the chain and is the basis for the subsequent calculation of emissions and costs. The calculation algorithm works from the tail process of a chain backwards through all processes in the chain moving along the input/output relations. For every process the values for all inputs are calculated which are necessary to supply the required output amount. In the case of deterministic calculation, the input and output values, as well as the corresponding emissions, for all processes have only one value. is independent of the shape, size or complexity of a chain. Every chain will be calculated in the same manner, regardless of the type of technology, represented by the chain. Examples for the working of the algorithm are described in full detail in the User Guide. For every process in the chain the emissions are calculated according to its previously calculated “level of activity” (i.e. the quantified inputs and outputs necessary to supply the final chain output). Emissions of all processes are summed up resulting in the total emissions for the chain. The basic calculation for a chain determining the output level of all processes is also the basis for subsequent cost calculations. Correctness of calculation results is guaranteed by the properties of the tool. The user can concentrate on the empirical aspects of modelling! In the case of Monte-Carlo calculations, the input and output values, as well as the corresponding emissions, for some processes, can have stochastic distributions. The calculations are carried out as many times as is decided by the user. For each iteration for every process in the chain the parameters subject to randomisation are determined randomly before starting the calculation. The stochastic features of the tool were implemented to enable quantification of uncertainties through confidence intervals around “best estimates”. For all the key individual processes within e.g. a fuel chain (i.e., the main steps of production, conditioning, transport, handling, and discharge), parametric probability values can be determined and then implemented to stochastically simulate the range of uncertainty for the overall pathway in question. This permits the calculation of 20th%-ile, 50th%-ile and 80th%-ile values of the frequency distribution of the result parameters. Also the level of N2O emissions can be subject to stochastic variations not dependending on other inputs or outputs. For each method, chains have to be modelled accordingly. The following examples of basic chain types show, how E3database handles different kinds of connections between processes. Two processes are connected by defining an input/output relation. This is only possible when the Main Output of the supplying process is of the same type as the Input of the receiving process. These connections are implemented by the user in the Graphical User Interface. 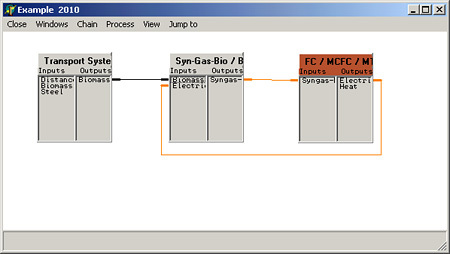 By clicking with the mouse on the corresponding input and output of two process boxes the connection is established. If the user trys to connect an input with an output of a different type, the program denies the setup of the connection. In this way the program ensures the physical validity of the modelled chain. The chain below models the generation of electricity by a Molten-Carbon-Fuel-Cell (MCFC): the input into the MCFC is syngas which is produced in a gasifier which gasifies biomass; the biomass has to be transported to the gasifier. The E3database calculation algorithm starts at the “Tail Process” (marked orange in the screenshot below) and works backwards until it ends at the processes on the left side of the screenshot. 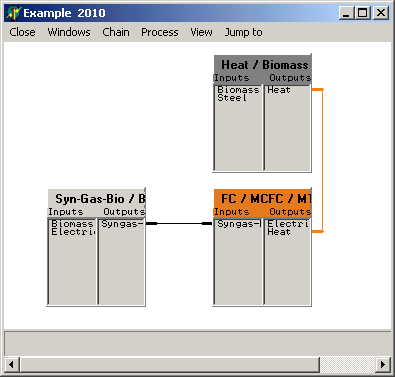 The fuel cell (MCFC) operated as a combined heat and power plant in the screenshot below is a typical example of a chain with co-production. The chain is modelled in such a way as to allow the calculation of a credit for the co-product (i.e. allocation by the substitution method). This chain has as main output “Electricity” and as co-product the output “Heat”. To account for the benefit of the co-production, the tail output “Heat” of a process which would be substituted by the MCFC (in this case the process “Heat / Biomass” which generates heat by burning biomass) must be connected with the co-product output “heat” of the “FC / MCFC” process. Due to the way how this chain is modelled, the E3database algorithm caculates this chain with the substitution method. In this chain “Heat / Biomass” represents the tail process of the substituted chain (in this example consisting only of a single process). The formal criterion for the substitution is the fact that two processes are connected via an output/output relation (and not, as is usual, by an input/output relation). In the calculation of the chain, all emissions and energy consumptions of the “Heat / Biomass” chain will be substracted from the “FC / MCFC...”chain. The definition of which output is a “Main Output” and which is a “Co-Product” is done by the user. In some cases, certain processes within the chain need an input which is produced as a main output in one of the following processes. In such a case, the result is a feedback connection as shown in the example in the screenshot below. In this case the E3database algorithm detects the feedback and a recursive calculation is started. The recursive calculation comes to an end when the difference between the result of the current iteration to the result of the preceding iteration is less than a value predefined by the user as a break condition. Analyses for energy systems in space. Fuels for aircraft and ships.